As I sit down at my makeshift desk I can’t help to wonder how all this is going to turn out. The wind outside the window is harsh and unforgiving, much as I have experienced Altdorf since I came here a scant three days ago. 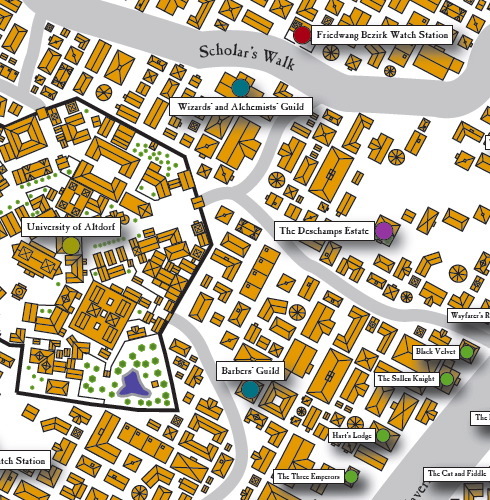 I miss the peace and warmth of Middenheim … or at least the Middenheim that was before the Storm of Chaos broke. Now … not so much. There is filth and despair and war all over the Empire. What will the new year bring? At least now I have a roof over my head. Very close to my head actually. After lugging my suitcases to the University I met with Emeritus Gutbelesen, the Professor of Societal Studies in Altdorf. He was in a mean temper, and very dismayed that I had showed up four days early. He even seemed somewhat discomforted, and when I asked if I could have access to my office even though I was somewhat early, a look of panic passed over his features. I’m not sure what that means, but he told me that the office was being rebuilt after an explosive accident, and that his regards for my safety demanded that I wasn’t allowed until Wellentag 13. That is 10 days from now. I tried to persuade him to let me have a look myself, but he insisted on me waiting for the room to be properly repaired. Instead he showed me up a rickety staircase to one of the myriads of towers that crown the University. Gutbelesen produced a huge keychain from under his velvet cloaks and unlocked a solid door which led to a small and dusty attic. This was to be my home until I could find a more suitable accommodation. He left me there, with an old desk, a handful of candles and a bed with a rock hard mattress for company. I unpacked as much as I could, after hauling my luggage from the bottom floor to the top of the spire all my myself. Actually, I find the University strangely empty and devoid of life. For sure, I startled Gutbelesen when I finally found him, so it seems most staff and stundents are off for holidays. Well, lonely and cramped as my room is, at least the view over Altdorf is unrivalled. I have windows in all four directions, and I hope to spy more of the capital once the sun comes up tomorrow.